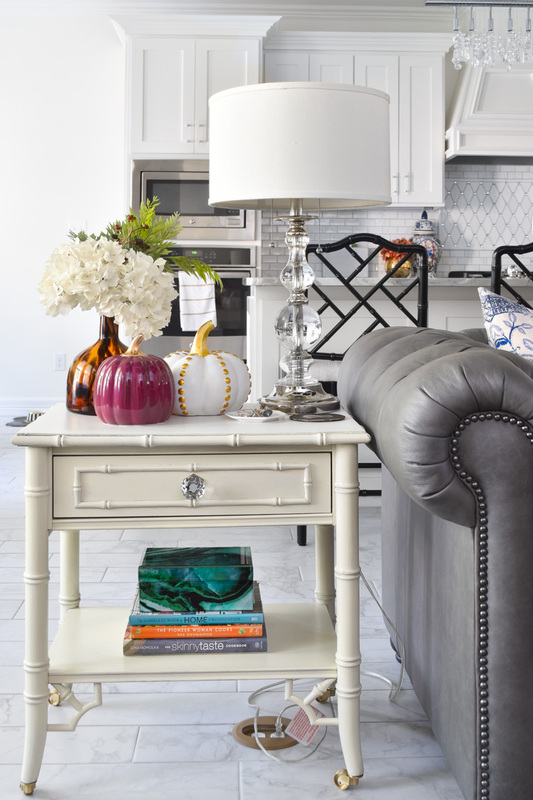 Today I’m talking fall decor vignette ideas that are chic, simple and effortless to put together as part of the Fall in Love with Texas home blog tours! I’m thrilled to partner up with my lovely fellow Texan bloggers to get you all in the fall mood. We’re finally getting a cold front next week, so fingers crossed it’ll finally FEEL like fall, y’all. 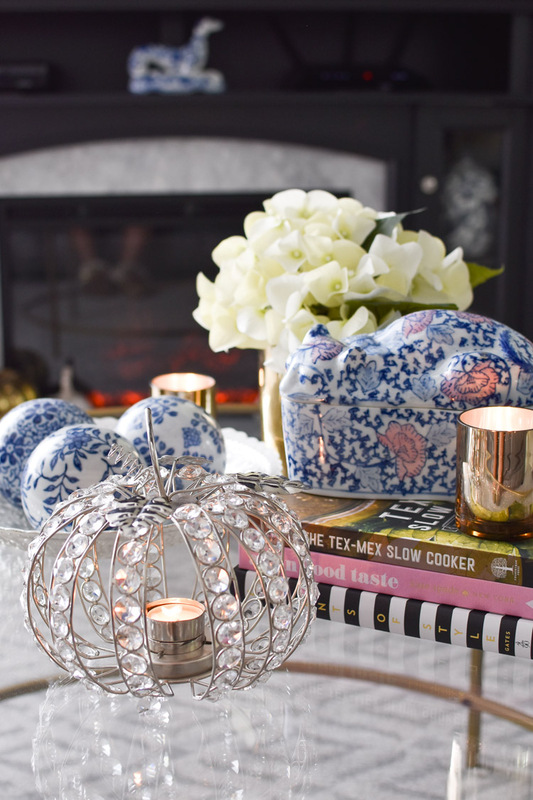 I created a full fledged fall home tour if you want to check that out, but today is mainly about vignettes- those small little decor scenes that are perfect for bookshelves, end tables, consoles and other small pockets of space in your home. 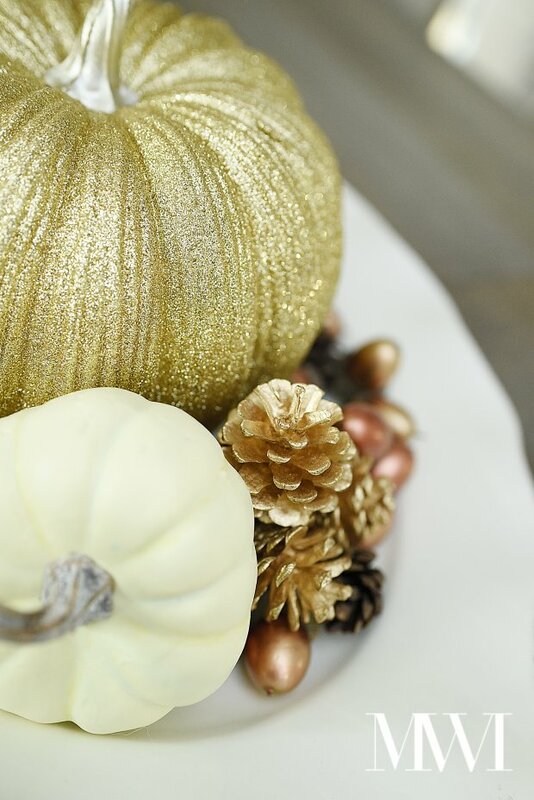 I find that vignettes for fall likely should incorporate pumpkins, gourds, acorns, earthy/warm florals, leaves, candles, metallics, pinecones and fauna (deer, squirrels, owls, etc) that make you think of fall. But putting them all together for a chic look is challenging for some, so I’m here with five easy tips. Affiliate links are used in this blog post- thanks for your support! If you want instant glamour and a chic, put together look, you should look to pairing metallic fall decor with neutral fall decor. Together, they look amazing. 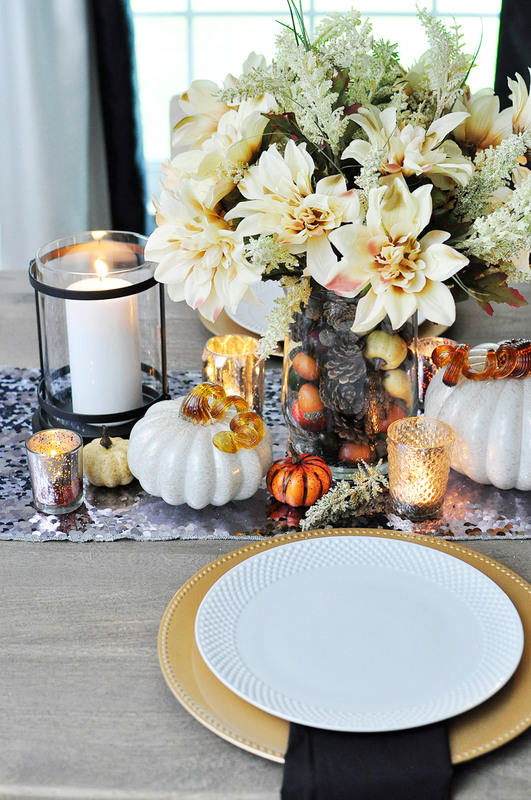 This photo below is from my fall home tour in my previous home before we moved, and this is simply a gold pumpkin, gold pinecones and white pumpkins on an ivory serving platter. Takes no time to put together. 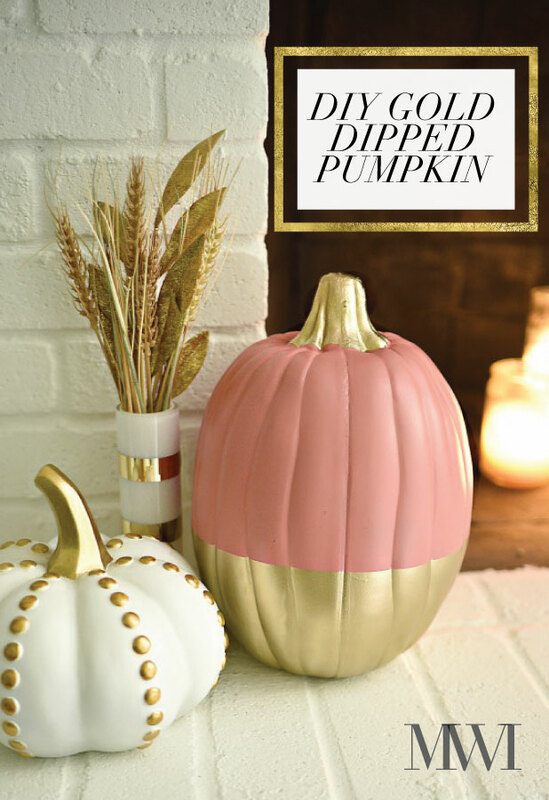 This two-toned coral and gold pumpkin is a HUGE HIT on Pinterest and goes viral each year. Elle Decor loved this so much they featured it on their website! 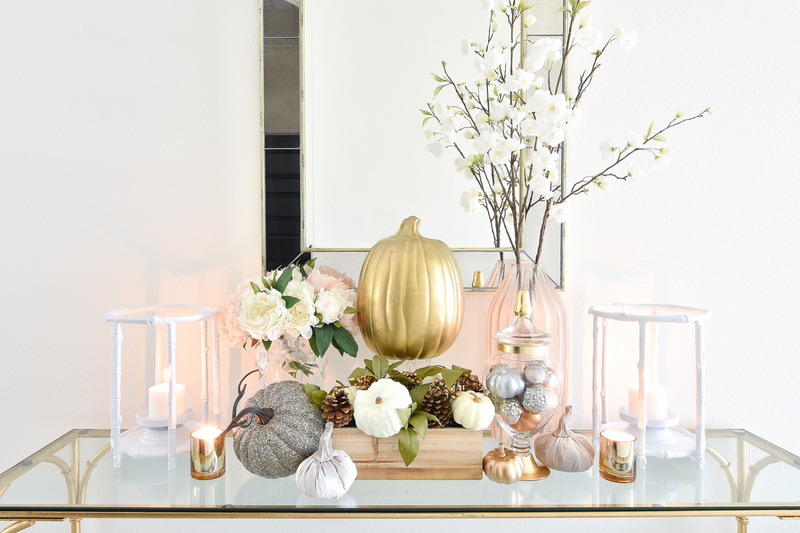 I applied the same principles in my recent fall home tour- gold pumpkins and silver pumpkins paired with white decor. It always simply works. This tip can apply to any season, but it’s particularly useful in fall when you have a lot of “stuff”. On an ottoman or coffee table, a tray can also define an area and make it quick to move in a pinch. Bonus points if it’s a lucite tray . In lieu of a tray, you can also use a large plate like I did on my bar cart (or use a serving platter like I did in tip 1). I feel this helps give interest/color and helps keep a vignette organized and polished. Candles can make anything look more glamorous, plus with all the amazing fall scents available, why not use candles? Only caveat is don’t use scented candles in a dining room- it takes away from the food. 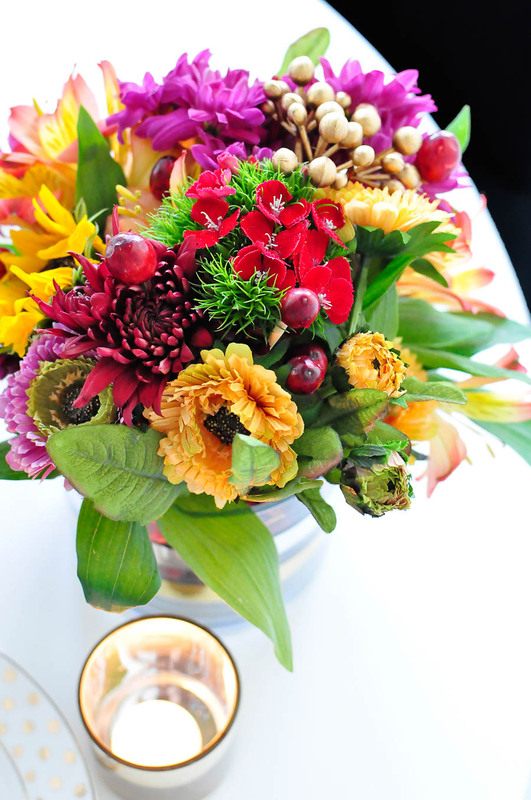 This rustic glam pumpkin floral centerpiece has so many warm, creamy fall colors and textures that truly come alive under candlelight. I also added a sequin table runner for extra glitz. I currently have smaller candles on my round gold coffee table so that if we have company I can quickly light them and they fill the area with a fall fragrance and warm glow. Unscented candles are super affordable, so buy in bulk when you can to enjoy year round. If ever in doubt about how to display something…use an odd number and 9 out of 10 times, it will work beautifully. On my end table, I have an eclectic vibe with two pumpkins and a tortoise shell decanter with some fall inspired hydrangeas. And in my dining room, I have an example using five decor pieces my butler stand. 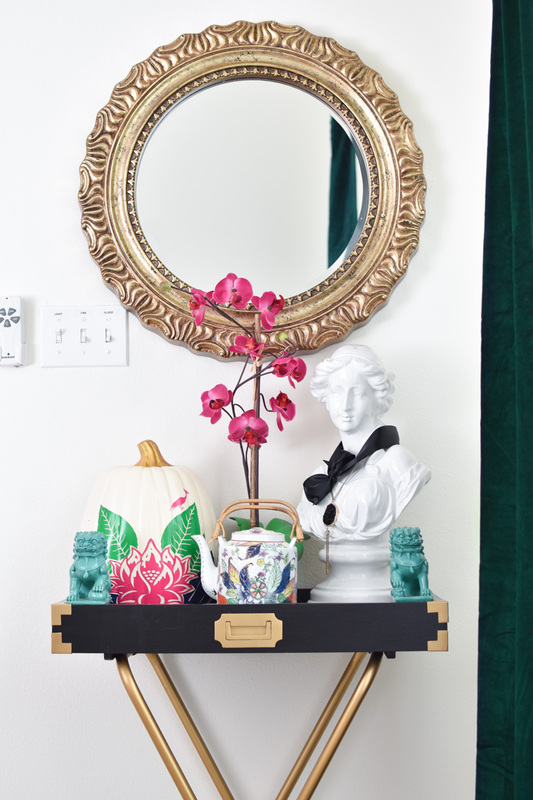 And even the number ONE is an odd number, so use one thing to make a bold statement if the decor piece is bold and larger scaled, like my tobacco leaf pumpkin. A vignette will instantly be more interesting if it’s a bit untraditional, which I’m sure you’ve noticed in my example photos in this post alone. 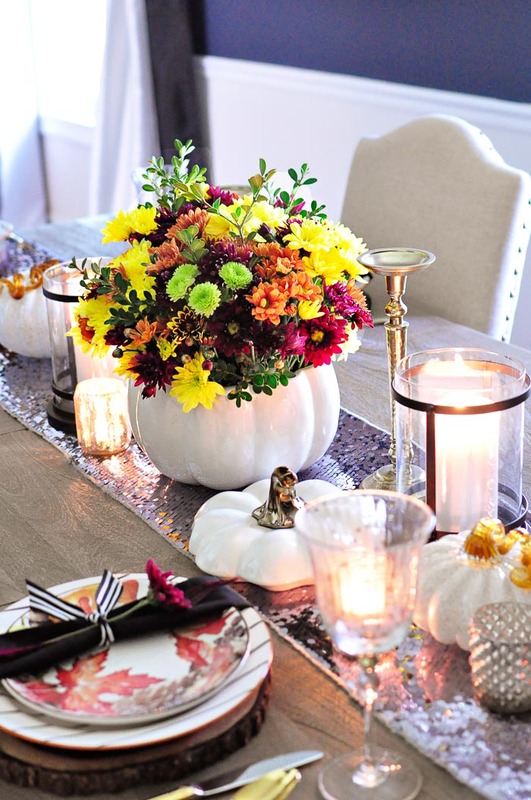 This floral pumpkin centerpiece (in a pumpkin soup tureen ) is a good example of many of my tips all in one. 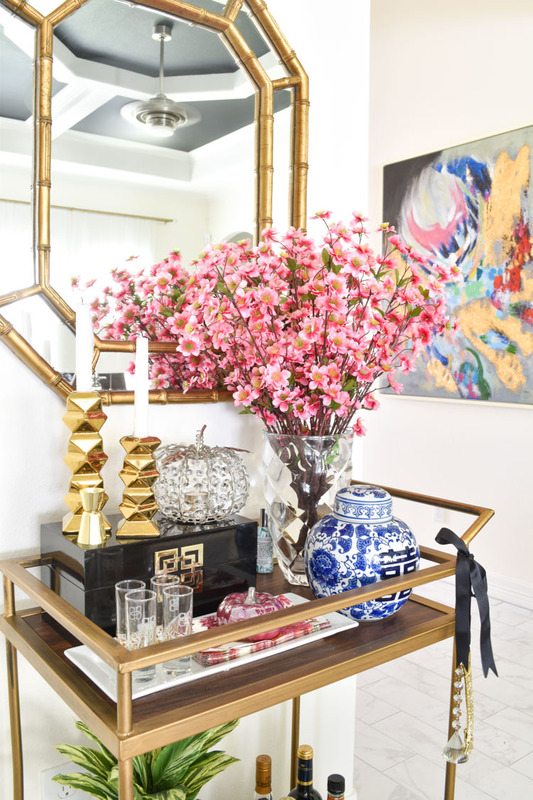 It has bold colors, candlelight, metallics and florals. Here’s another photo showcasing how I mix and match bold elements with traditional fall decor by using fall florals (real and fake), cranberries on bamboo skewers and metallic accents. 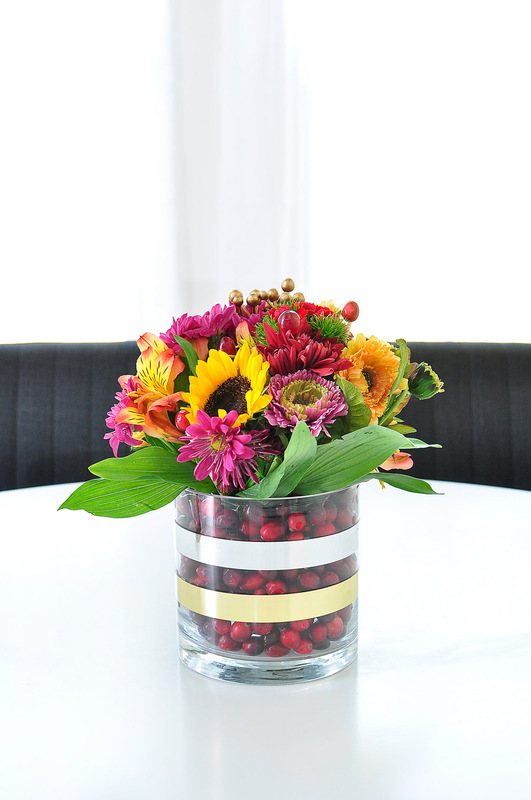 Cranberries are also layered in the vase to create this colorful fall floral arrangement that would look beautiful in any vignette. Those five tips can truly be applied to any holiday or season, so keep them in mind when you’re trying to decorate your home. I honestly believe that as long as you love it and it makes you happy, then you should go with it. Love all of your tips! Your ideas are always beautiful. Lots of beautiful ideas! 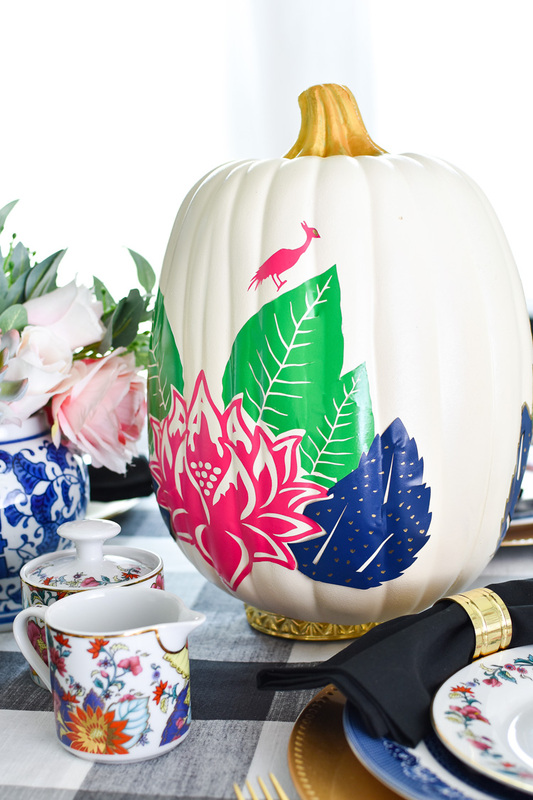 Your painted pumpkin is gorgeous and I love the colorful arrangement in the pumpkin tureen. Thanks, Monica. 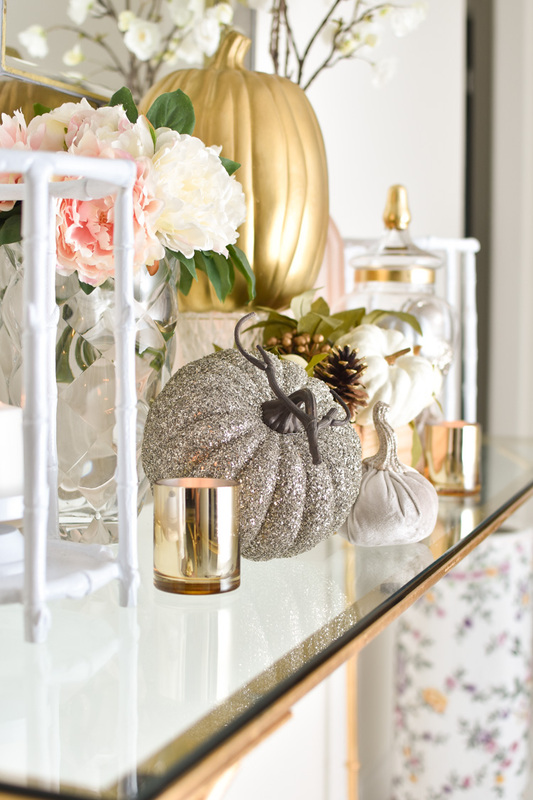 Your fall vignettes are charming. Thanks for sharing the inspiration. I'm off to visit your full tour. Happy Autumn! Monica, this is all stunning! Your style and my style are not the same but I'm thinking a little more of your style needs to come to my house!. :)Pinning and sharing these fabulous ideas. Your tobacco leaf pumpkin is just AMAZING! I adore all of the glamour you have incorporated on this fabuolous tour Monica. Oh, my….this is such a stunning post. Everything is just beautiful. 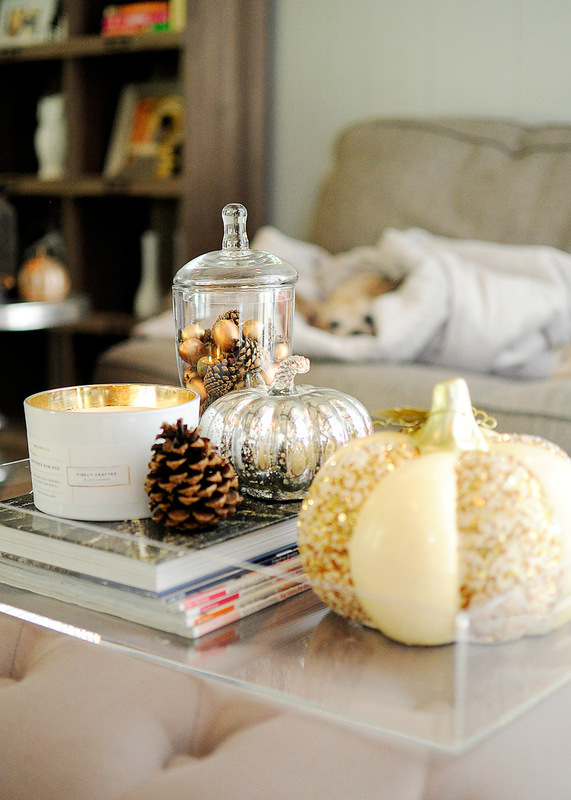 I loved seeing how you created all those pretty Fall vignettes around your home. Thanks for all the inspiration!